You know, on this journey to Europe, I follow in some large footsteps. More than two centuries ago, Benjamin Franklin arrived on this continent to great acclaim. An observer wrote, His reputation was more universal than Liebniz [sic] or Newton, Frederick or Voltaire, and his character more beloved and esteemed than any or all of them. The observer went on to say, There was scarcely a peasant or citizen who did not consider him as a friend to humankind. I've been hoping for a similar reception. Call me a partisan curmudgeon, but I don't find this characteristically Republican-smarmy joke to be particularly funny. And yes, he pronounced Leibniz as if it were Liebniz. Kudos to the transcribers for not correcting his fuckup. We often quote speeds and other performance data (such as printer speed, 56K modems or processor speeds). Please note that these quotes are for comparative purposes only. Actual speed varies with environment, equipment and other factors, and will be less. In other words: Dude, you're getting a sell. Earlier this month, I wrote about dreams I'd had, dreams about things I miss, things that aren't available where I live. 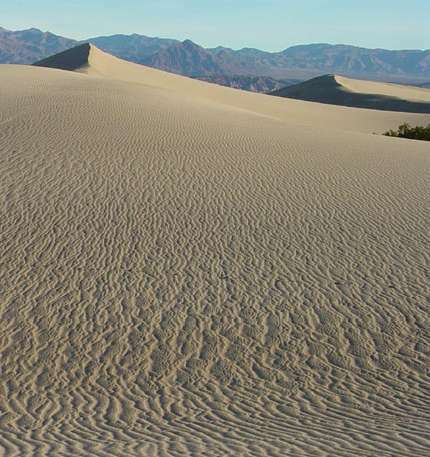 Sand dunes, Death Valley; from a USGS photo. The Gender Genie applies a primitive algorithm to guess whether a piece of (English) text was written by a male or a female. Don't worry; the genie's host doesn't take it too seriously. Upon considering a few sample Tommyjournal texts, the genie said I'm male, not that you should place much weight on that; the stats say the genie is correct only about 60% of the time. Students at James Monroe High School in Fredericksburg were talking about the legislation yesterday. "I think it's pretty bogus, definitely," said 15-year-old Kealan Sojack, a freshman who was wearing baggy jeans. "Underwear is called underwear for a reason," said Republican politician John Reid. "Most of us would identify this as the coarsening of society." I hope this ends up in the courts. And I hope that in a news conference, someone asks the President about activist judges imposing their personal views about a right to show your underwear. A beta version of Google maps is available. The good news: great user interface (e.g., pan by dragging with the mouse), nice looking graphics. The bad news: it doesn't work on some browsers. That seems to be a (disturbing) trend at Google; early versions of gmail didn't work with a number of browsers either. My neighborhood is incorrectly represented on every mapping site I've tried, so I didn't expect Google to have perfect data for it. What surprised me, though, was how far off Google's database is. It looks like someone entered every path (or remnant thereof) that they could see in an aerial photo and assigned them names by who knows what method. Google thinks that pretty much every sketchy dirt road in one area is named Tuttle Creek Road. I love the way the text snakes around bends. Google's route from my house to San Francisco uses a dirt road that you wouldn't want to take most cars on; can you guess what Google thinks it's called? Why does this interest me, you ask. I've been writing routing software for a living for the past 20 years. Not street routing, but rather electronic circuit routing--different in many ways, but both are at heart path finding (i.e., graph search) problems. I wouldn't mind another dream that picks up where the last one left off. I'll see what I can do. After writing that, I went to sleep and had a dream that picked up where the previous one had left off. It continued with instance(s) of what I used to enjoy that I now miss, only this time more intensely and with more of a sense of frustration. What can I say. I asked for it. I want to face the full truth about my situation. I have this (strange?) notion that the more conscious I am of what's going on in my life, the better. Now, off to sleep again. Interesting dream last night. I was at some kind of retreat or training that was held at a pleasant college-campus-like facility. For a while I was in a classroom, sitting in the back, and although I wasn't volunteering to answer any questions I did try to say something intelligent when the instructor called on me. But my heart wasn't really in the process. I said something about how powerful habits can be. The instructor asked me to elaborate, and I said that it's easier to get stuck in habits if you spend a lot of time in association with people who also run on automatic most of the time. The instructor spoke to me one-on-one after class, and asked whether I had Ouspensky's teachings in mind when I spoke about habits. I said yeah but added that I didn't agree with Ouspensky's views on immortality. We walked past a recreation room and I saw people playing foosball and remembered a job I had some 15 years ago where I played a fair amount of foosball. I realized I missed certain kinds of interaction with people. That was the moment of the dream that really got my attention, it made me think, and it made me want to write about it. Just how social a creature I want to be has been a tough question at various points in my life. I was fairly well adapted to doing things on my own as a teenager (largely out of necessity). I spend a lot of time by myself again now, sometimes readily and sometimes not. I'm not as cut out for the independent life as some people are, there are things that I miss living here in the desert. That longing really came to the fore in last night's dream. When I moved to the desert seven years ago, one of my goals was to live more deliberately. Without so many distractions, I'd be more aware of what choices I made and would learn to be more mindful--at least, that was the plan. Did I do what I set out to do? Honestly, not as well as I had hoped for. But falling short in some areas has been balanced, sort of, by experiences that I hadn't expected. Not a bad outcome overall. For better or worse, I'm largely settled here. City life is not what I want right now, last night's dream notwithstanding. I'm surprised that a bank teller doesn't eat a check. Much as I hate to disappoint a credit card company, my diet doesn't allow for enjoying their checks. I gave them to my shredder instead, which devoured them con gusto. All those aerodynamic, gelatinous, dented cars with super-smooth curves, massive salivary anatomy, fleshy thighs, and flabby stomachs of the 'Modern-Style-Mae-West' type, all those aerodynamic and atmospheric cars with fat, compressed, exuberant, and sticky viscera are nothing else -- and this is what Salvador Dali tells you and guarantees -- but real 'blackheads' that pop out, all slippery, solemn, atmospheric, and apotheosic from the very nose of space, the very meat of space.